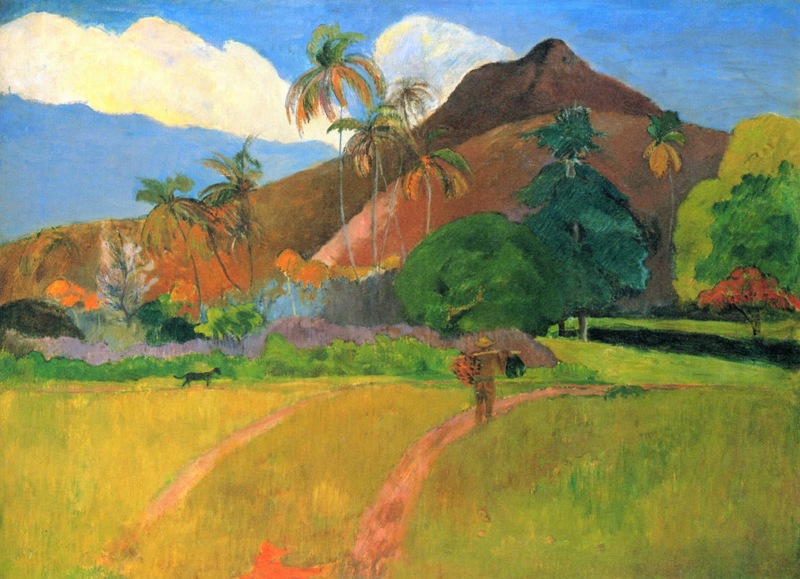 The artist I researched was Paul Gauguin. In his artwork he used simple shapes, bright colors and a thick coat of paint. 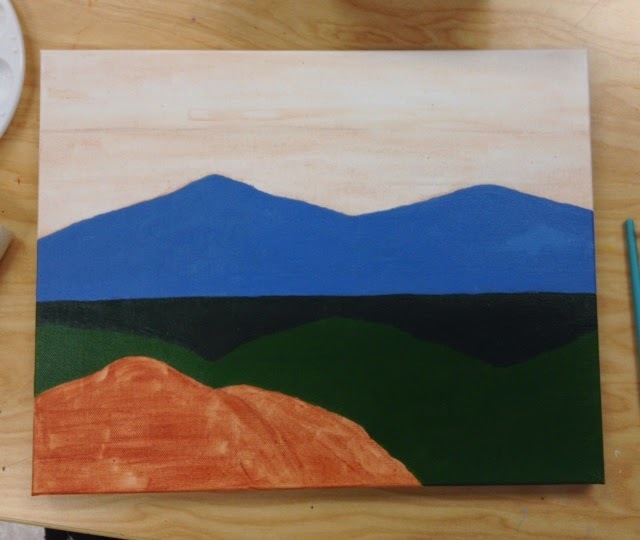 I decided to pain a picture the mountains with a sunset behind them. First I did a couple sketches in my sketchbook. Then I sketched it out on my canvas and painted on my tonal. Next I painted the grass and bright-ish green with a thick coat of paint and then I did the mountains a light blue/grey color. All of those shapes were very simple. Last I painted the sky and I used very bright and bold colors. The sky looked rainbow almost. Did you try something that you weren't sure of as part of this project? Yes, I painted a very colorful sunset and at first I wasn't sure if I would be able to blend the colors of the sunset very well. Did you pick a material or technique that was new or different over something familiar? Yes, I used very bright colors and thick coats of paint. I don't usually paint with acrylic paint either, I usually use oil paints so it was a little bit more difficult. How did you use your own unique ideas in your work? 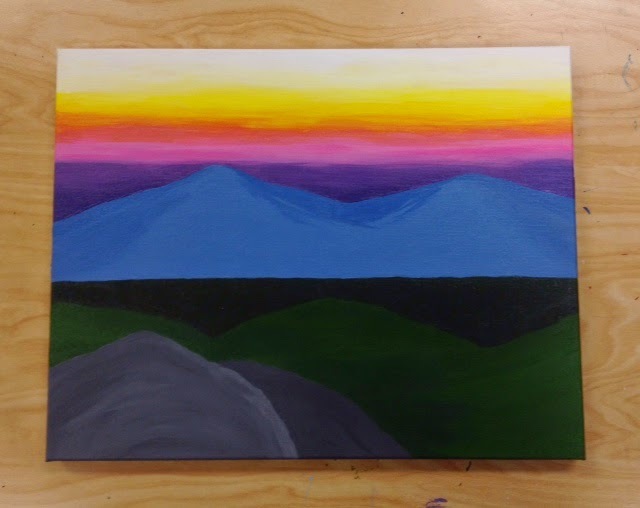 I came up with the idea of painting a really bright and colorful sunset behind the simple mountains. I wanted to add a splash of color to the painting. Did you use a source for inspiration, then combine it with your own ideas to make it original? I imagined an image in my head of the mountains with the sunset in the background so I looked up some images on the computer to get a clearer image in my head. 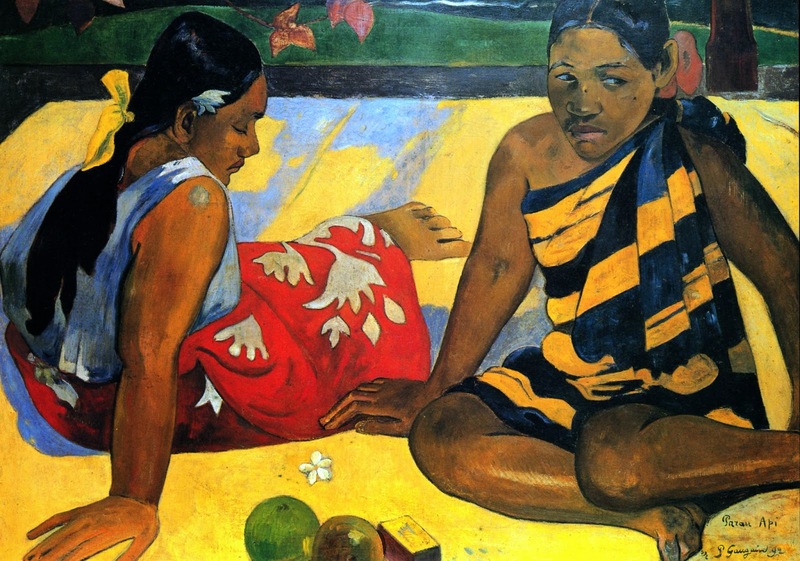 I also looked up some paintings of Paul Gauguin so I could understand his style better. When did you step back and analyze your work during this project? I analyzed throughout the process of painting it but I really got to analyze it once I finished painting. Overall I think the painting turned out pretty decent but I couldve added more detail. Did you consider how your ideas would work before you tried them? I did consider how my ideas would work before I tried them and most ideas worked but my main challenge was blending the colors.